Jeanne from Cook Sister has a hilarious little monthly blogging event called EoMEoTE which grew from some posts between her and Spiceblog , in which they ripped the piss (just a little) out of online food blogging events. Nowadays there are so many, and it's hard to keep up with them all, although Ronald does a good job of hosting a site that tries to track all of the different cooking challenges. All that EoMEoTE = End of the Month Egg on Toast Eggstravaganza requires, is that you cook some eggs and some toast and post about it. I wasn't intending to join in, but I have been sick. I have been walking around three days with a leathery tongue and a gruff throat, feeling shaky. I was definitely out of sorts, I actually elected to eat lunch at Foodles for two days in a row! I have been quite enjoying having a long scarf wrapped several times around my neck at all times of the day. It's cozy! I was even considering wearing it in bed but Fred rolled his eyes at the sight of me naked with a bunch of little black pom-poms hanging around my neck and I thought maybe it wasn't such a good idea. Whisk two organic, brown, non-pateurized eggs together with salt and pepper. Melt a knob of Celles sur Belle French Butter in a small non-stick pan over low heat. Add the eggs and stir gently until softly scrambled. Serve over a slice of thick, crunchy, white toasted bread and crown with a slice of prosciutto. 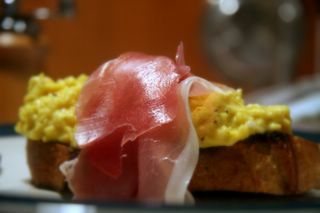 Hope you're feeling better - that piece of prosciutto draped over the scrambled eggs had me hankering after a bite of your comfort food... Little known fact: when I'm hungover, all I crave is a piece of toast piled high with Hellmanns mayo, scrambled eggs and lots of cheese on top - an instant pick-me up! Great to have you join us for EoMEoTE - even if it wasn't planned! when you mentioned the scarf and the eye rolling, i thought of an anecdote told by lisa kudrow. someone asked her about her fashion sense, and she said it helps that her husband is french; every time she puts on an outfit he doesn't like, he rolls his eyes and says "baby, why do you hurt me like this?!" Yum! That's a great idea. I like to put prosciutto on everything, but I never thought of eggs and toast. I'm going to try that very soon.